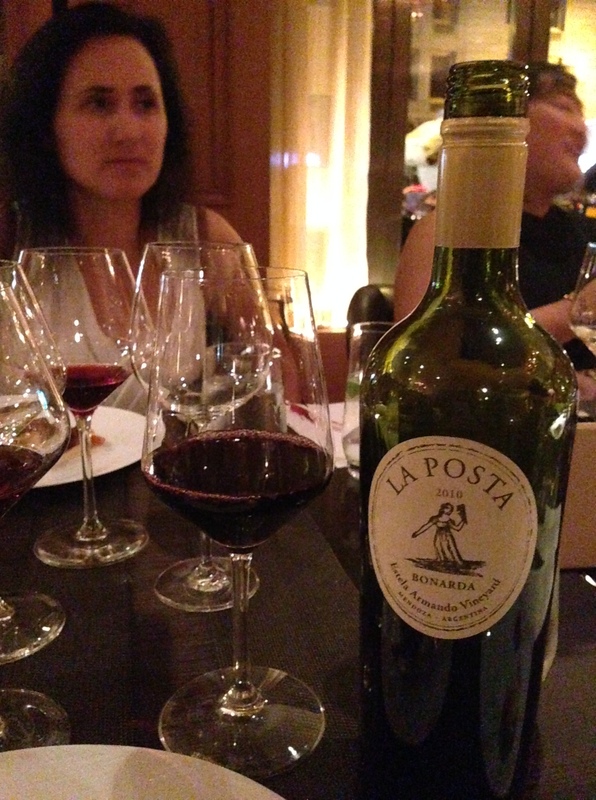 One last post about Argentina wines (which makes me sad), and the family that has elevated it to a new place. 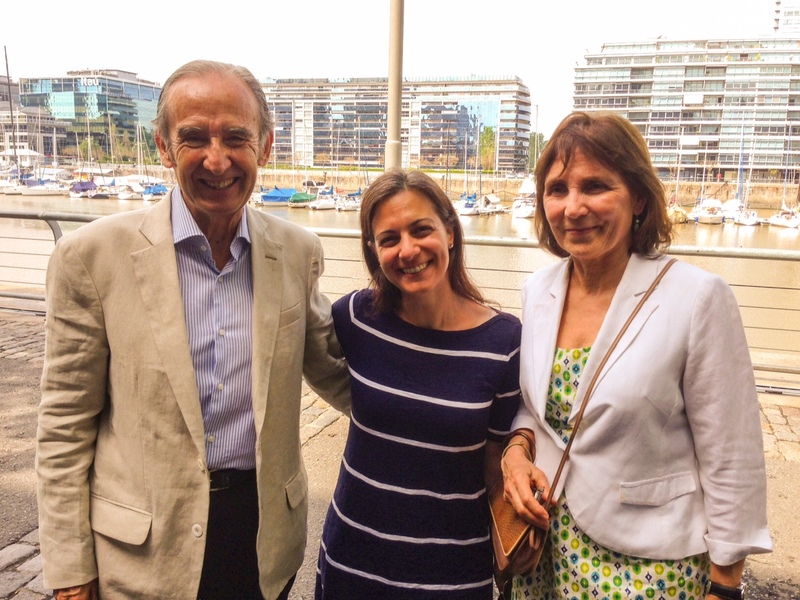 On the last day of our whole trip, we landed in Buenos Aires and went straight to lunch where were greeted to the city by Nicolas Catena and his wife Elena. That’s basically like landing in Napa and being greeted by Robert Mondavi. We ate at the amazing Cabaña Las Lilas, said to be the best meat in the city – a lofty claim in a country that served me roughly 10 kinds of meat per day every day, but Las Lilas did not disappoint. 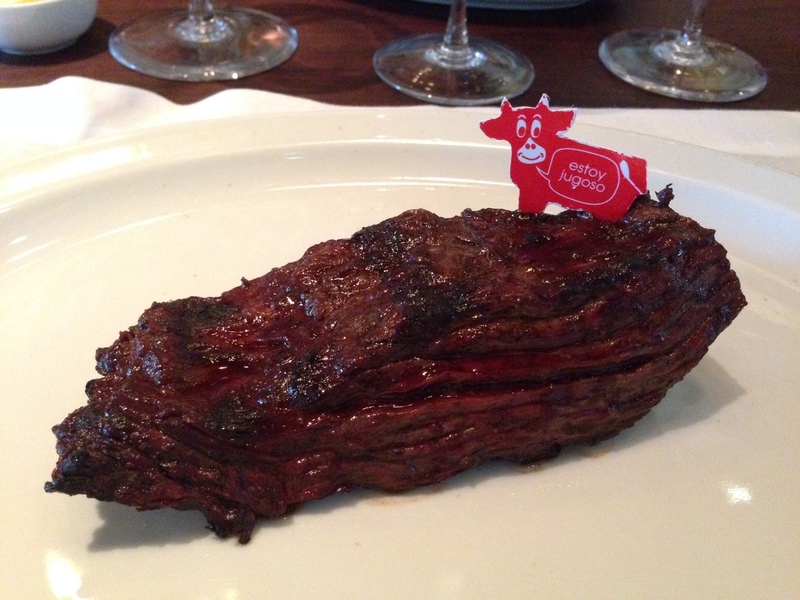 Plus, your awesome piece of meat comes with these cute little cow signs! 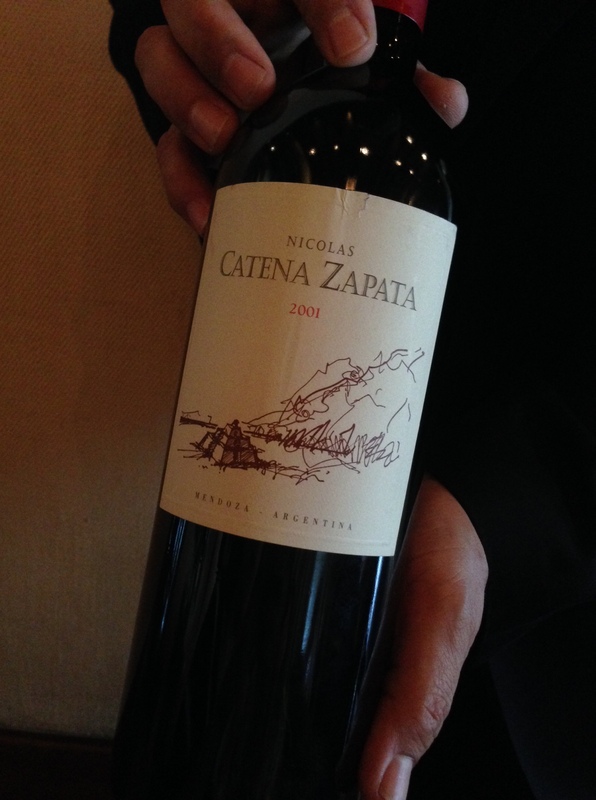 Obviously and more importantly, we had some killer Catena wine with all of our great meat – this 2001 Nicolas Catena Zapata (half Malbec, half Cab) was incredible. 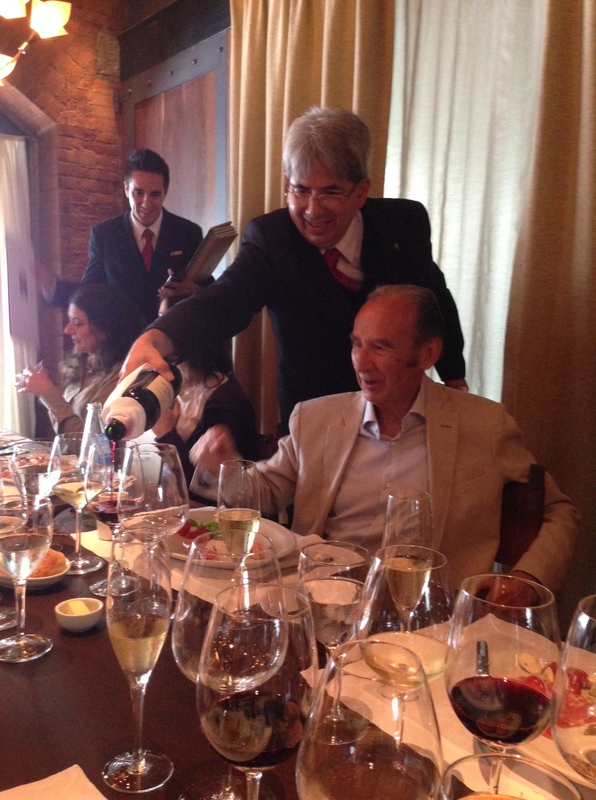 Over lunch, Nicolas told us some great stories about their family’s wine history. Nicolas’s father got to Argentina in 1902 (Argentina has a large population of Italian immigrants). He always thought France was #1 for wine and then came everyone else. It’s not completely wrong – French wines take me to another place entirely! Unfortunately most Burgundy and Bordeaux is crazy expensive. The Catenas were planting grapes in Mendoza, mostly Malbec and Riesling. They planted way up high in the Adrianna vineyard – people told Nicolas he was crazy but he took the risk and waited to see what would happen. Then the 70s came. The 1976 Judgment of Paris, where California wines beat French ones in a blind tasting, is usually thought of as what changed the playing field for American wines. But Nicolas said that it changed things for Argentina wines, too – for the first time they also felt like they could battle against France. Was interesting to hear how that event changed things for other countries and other wines. In 1982 Nicolas and Elena visited California and went to the Mondavi winery, just as tourists. Later on, they’d get to be friends with Robert, who would always share wine knowledge with him unlike the French who apparently were pretty jerky about sharing info. So two Italian immigrants in two different countries were suddenly making wine that rivaled the French. And now, that’s what the Adrianna vineyard wines are all about – the best wines come from that altitude and the Catena family has gone on to do incredible research about sunlight intensity and how it gives certain grapes amazing flavor. We finished our wine and our meat, and over our dulce de leche panqueques (basically, caramel crepes, YUM) we all went around the table and said how our impression of Argentinian wine had changed over the course of the trip. For me, I tasted some fantastic wines. Not just Malbec but, surprisingly, the Chardonnay was great and even some of the Cabs, plus some lesser known stuff like Bonarda and the lovely aromatic Torrontes. But what I mostly took away was the warmth and hospitality of the people everywhere we went. We shared huge meals at wineries, at people’s homes, drank wines from years ago and ones just bottled, rode horses (at Nicolas and Elena’s son Ernestos’s ridiculously gorgeous vineyard) and walked through rose gardens. Even when I was in Buenos Aires for a few days after the trip, Elena took me to a museum and to lunch and to their friend’s amazing little Italian cafe in the Palermo neighborhood – so above and beyond what anyone needs to do for a visitor and I’ll always remember what a great, fun day we had together. All throughout the trip I got to know so many people from multiple continents and laughed a ton. 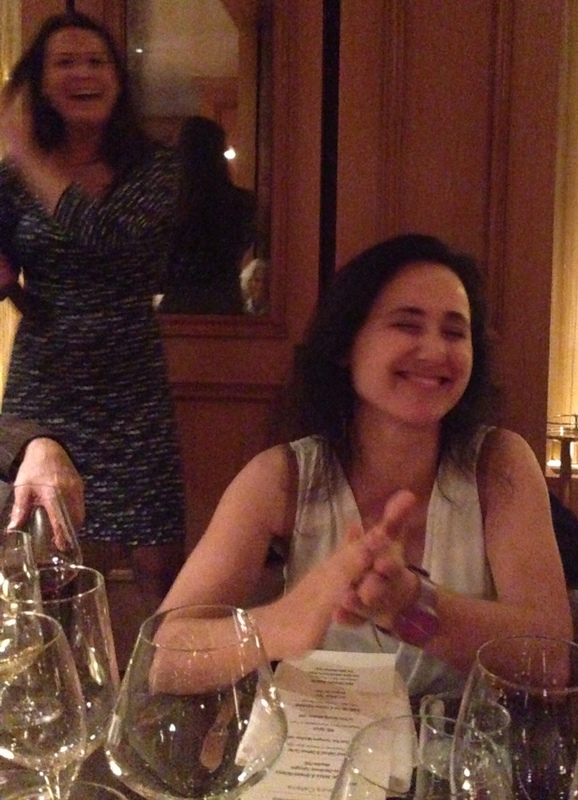 Most of all I love that – how wine brings people together and how it’s meant to be shared. While we were having lunch, there were people outside on the deck celebrating Argentina’s Mother’s Day, clinking their glasses of sparkling rosé. It made me think that wine is always at the best moments. Back in New York, their daughter Laura was in town for a dinner with some wines that she started on her own (the dinner was also partly to benefit the Crossroads Community Women’s Shelter at St. Barts). Laura’s the kind of person who would make you feel like the biggest piece of lazy if she weren’t so cool: she’s an ER doctor in San Francisco, teaches medicine, makes her own wine, took over the R&D for Catena in 2001, and has three kids (which is where she got the names for her wines Luca, Beso de Dante, and Nico – short for Nicola). Marika Vida, the wine director who put the dinner together at the Ritz, said she could barely find a way to make cupcakes for her own kids’ Halloween party. “I don’t make cupcakes!” Laura said. Oh, that’s how you get everything done! Being a doctor Laura never wanted to get into the family business. But one year, she went to the New York Wine Experience, a huge event in NYC where people can sample some of the greatest wines in the world. Catena was the first Argentinian wine to be asked to come so Laura went, but when she was there everyone just passed by the Catena table to get to the Lafites and Moutons and all the other famous wines they’d actually heard of. Laura said that’s what made her join the wine business then – her family and her country needed her wine help. And thank goodness – we drank some really interesting Bonarda of hers and were lucky enough to also drink this awesome 2006 Nico Malbec out of an Imperial (massive bottle that’s the equivalent of 8 regular bottles!). It’s amazing the places wine has brought me. I started this blog as a lark, just to share what I was learning when I was studying wine and to have a little fun. I could never have imagined the experiences and people it would lead me to. 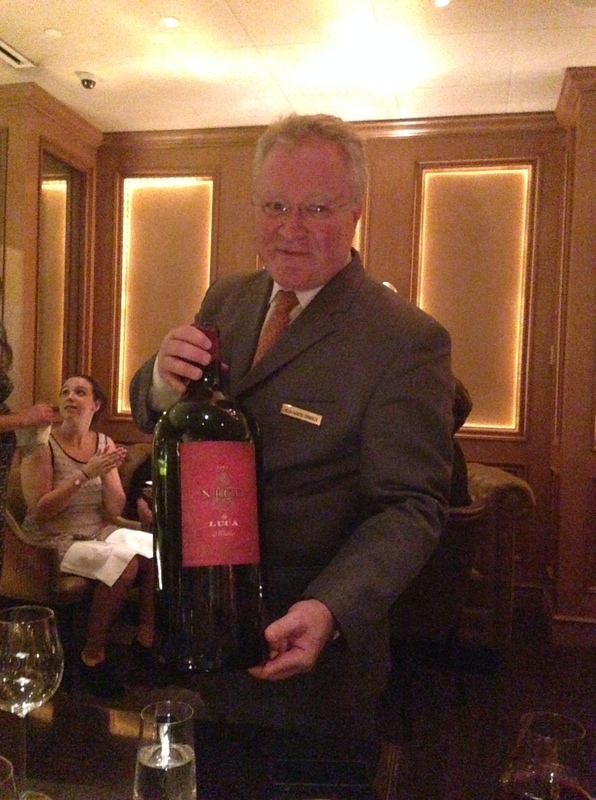 At lunch Nicolas said, “Dreams are what bring us to happiness.” Wine helps too! Tags: argentina, bonarda, cabernet, catena, chardonnay, food & drink, malbec, mondavi, napa, Torrontes, wine. Bookmark the permalink. What a wonderful experience and a wonderful post!